Breast augmentation is a procedure that enhances the shape, size, and proportions of a woman’s breasts using implants. Should You Consider Breast Augmentation? Our Breast Enhancement Cosmetic Self Evaluation can help you decide if breast augmentation is the right procedure for you. Breast augmentation is the single most popular plastic surgery operation chosen by women in the US. Breast augmentation can create beautiful breasts that can enhance and restore balance to your figure and increase your self-confidence. From work outfits to evening wear to swimsuits and lingerie, clothes will fit better, your figure will be more balanced, and your breasts more attractive. It is very important to choose a surgeon who has a similar innate aesthetic to your own. If you want breasts that have a bulge on the top and look like a grapefruit, then Dr. Fan would not be your best choice. But if you want to have breasts that will look gorgeous clothed or undressed, then San Francisco's leading breast augmentation plastic surgeon, Dr. Larry Fan is a great choice. Read on to learn more about Dr. Fan’s expertise and approach to breast augmentation. Women whose breasts never developed proportionately, are limited in the clothing they can buy, and who would like more confidence in their appearance. Women who have lost breast volume after breastfeeding and want to restore what was lost and fill up what may have become an empty breast. Women whose breasts are not just small, but are misshapen, are also good candidates for breast augmentation. Women who want to be large and disproportionate, the “Baywatch look,” make up a small percentage of women who get breast augmentation. Women with drooping breasts may require a breast lift. All women who are considering breast augmentation should be doing it for themselves, not for a boyfriend or spouse. You must be healthy enough to undergo an elective operation and mature enough to weigh the risks and benefits of surgery. Perhaps more than any other plastic surgery procedure, breast augmentation requires careful preoperative analysis and planning. Dr. Fan uses a consistent, proven, and highly effective method for measuring your tissues to determine your ideal implant size. He will also discuss with you other important choices related to your procedure including; implant type, implant size, implant shape, implant texture, incision location, and pocket location, which you can read about more in our FAQ section. Medications are administered for your comfort during your surgical procedure. The choices include general anesthesia and intravenous sedation. Dr. Fan will recommend the best choice for you. Incisions vary based on the type of breast implant, degree of enlargement desired, your particular anatomy, and your preference. It is important to note that no single incision / approach is universally considered preferable for all patients. Dr. Fan is skilled with all four approaches and will help you decide which incision options are appropriate for your desired outcome. Positioning of the breast implant depends on the type of implant, degree of enlargement, and your body type. 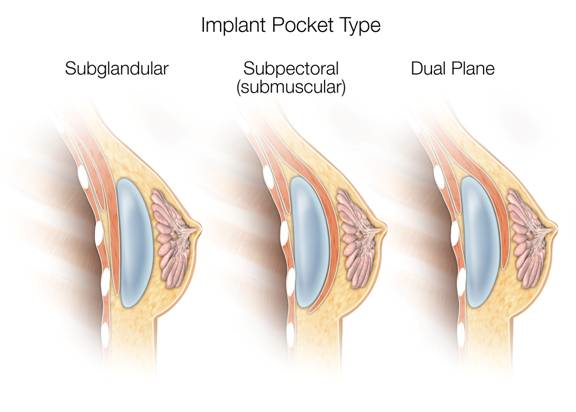 Placement of implants under the muscle may interfere less with mammograms and breastfeeding and are associated with lower rates of capsular contracture. Dr. Fan will help you decide which positioning is appropriate for you. Incisions are closed with layered sutures. Once healed, the incision lines from breast augmentation are typically concealed in inconspicuous locations. Breast augmentation usually takes one to two hours to perform. While it is technically possible to perform the surgery as quickly as 20 minutes, we believe that performing a careful, precise dissection with full control of bleeding and meticulous pocket control leads to better results. You will typically be discharged home after surgery. Some women will require a breast lift. Breast augmentation is often combined with liposuction and a tummy tuck as part of a Mommy Makeover procedure. Benefits: The end result of breast augmentation is fuller and more shapely breasts. Need for Future Procedures: Breast implants are designed to last for many years, but there is a chance they may break or develop issues with ripples, malposition, sagging, scar tissue, etc. It is more likely than not over the course of your lifetime that one of these problems will arise. If one of these problems arise, you will need to have another procedure. Need for Special Mammograms: Breast implants are considered safe and not known to cause cancer, but you will need to undergo special mammogram views when undergoing mammography for breast cancer screening. Your breasts will have a different feel or consistency to them after surgery. For most women, this is a positive change, as their breasts will feel more full and shapely than ever before. Women are often worried about looking unnatural or “fake.” This is avoided by choosing an implant sized appropriately for your tissues. With our careful technique and attention to detail, many patients can return back to normal activities within 24 hours. However, it is important to realize that breast augmentation surgery stretches the breast tissue and can be uncomfortable. The highest level of discomfort is typically experienced within the first 24-48 hours after surgery. Your pain level will typically decrease each day, and you will be given medicine to help alleviate the pain. You should expect mild to moderate swelling and possible bruising. The breast implants often ride high early in the postoperative period and may take two to four months to settle into final position. The recommended time off work is typically three to seven days. Dr. Fan will give you specific instructions that will include how to care for the surgical site, what medicines to take to aid healing and reduce the potential for infection, what activity limitations to follow, what concerns to look for at the surgical site or in your general health, and when to follow-up with our office. Dr. Fan will also discuss with you how long it will be before you can return to vigorous activities and exercising. It is important for your safety and outcome to return to our office at prescribed intervals after surgery and whenever you have any questions about your healing and results. It is very important to choose a surgeon who has a similar innate aesthetic to your own. If you want breasts that have a bulge on the top and look like a grapefruit, then Dr. Fan would not be your best choice. But if you want to have breasts that will look gorgeous clothed or undressed, then read on to learn more about Dr. Fan’s expertise and approach to breast augmentation. Dr. Fan’s approach to breast augmentation is the result of years of study, research, and practice. He is known for his exacting surgical technique and his highly refined aesthetic sensibilities born out of a passion for art. Together, these skills allow Dr. Fan to create breasts that are natural and simply beautiful. Dr. Fan’s highest priority is creating beautiful, proportional, and natural results that last, leaving your tissues undamaged so that your breasts remain attractive for decades. As a surgeon who sees many women for revision of earlier breast augmentation procedures, he is particularly sensitive about avoiding surgical decisions that can lead you to long-term complications. It is with great precision, planning, execution, and attention to detail that Dr. Fan’s breast augmentation patients just look beautiful and proportional, with nothing obvious or unnatural about their appearance. You will not wake up from surgery with breasts that are bigger or smaller than you expect because you will understand and participate in every decision made about surgery. You can rest assured that it is Dr. Fan's highest priority to give you a safe and clinically excellent procedure that results in the most beautiful breasts possible. Read more about Dr. Fan's San Francisco plastic surgery center. The cost of breast augmentation varies from person to person and depends on a number of factors including your specific needs and desired results. Costs of surgery may include fees for the surgeon, anesthesia, operating room, facility, equipment, implants, garments, aftercare, lab tests, and medications. The cost for breast augmentation ranges from $8,000 to $15,000. For breast augmentation patients from outside the San Francisco area, travel and accommodation costs should also be considered. We offer a range of patient financing plans including low monthly payment plans and plans for those with suboptimal credit histories. The results of breast augmentation are immediately visible. Final results will be visible over the course of a few months as swelling dissipates and your tissues relax. Breast augmentation will help you obtain fuller and more shapely breasts. Women are often worried about looking unnatural or “fake.” This is avoided by choosing an implant sized appropriately for your tissues. Most women have at least minor degrees of natural breast asymmetry. It is common for these asymmetries to persist after breast augmentation. Dr. Fan is known for his artistic eye, expert hands, experience, and meticulous attention to detail. He is also known for his outstanding breast enhancement results.